With Nicole’s Kindergarten right around the corner, and the baby’s due date in the not to distant future, I’ve been thinking a lot about how best to ensure each child gets the individual attention he or she needs. This spring Nicole wasn’t eating her school lunches. I told her if she eat at least two bites of everything on her plate every day for a week, I’d pick her up for lunch the next Monday and we’d go to a restaurant. Just the two of us. That was all the motivation she needed. She was super excited and eat like a champ, even the vegetable, often eating more than the stated minimum. A few weeks later the elementary schools were all out on break for the spring holiday. Daycare attendance was surprisingly light as a lot of parents decided to keep both kids home, rather than just the school age child. The more I think about it, the more this creates a nice opportunity for a Mommy & Me day. 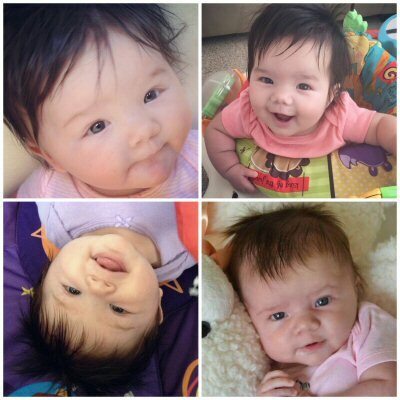 The kids are at different developmental stages. Nicole loves to play with beads, and make necklaces and bracelets. That’s hard to do on home days with a little sister around who sometimes puts things in her mouth. Alexis’ attention span for coloring is roughly ten minutes, where Nicole can go on for hours. Nicole is old enough to sit quietly through a movie at the theater. Alexis, not so much. The usual result of these differences is the older child is relegated to the activities the younger child. If Nicole’s school is out, but Alexis’ is still in session, that doesn’t have to be the case. The opposite is also true, and Alexis will have the opportunity to have the big doll house and kitchen all to herself. We can spend time reading just the books she enjoys, and she won’t have to wait for Nicole’s longer chapter books to be finished. To put this philosophy to the test, Domingo and I decided to enroll Nicole part time in her final week of preschool. She’ll get two special home days with Mommy before starting kindergarten. We’ll go to the movies, pick out her new school bag and lunch box, and generally do whatever she wants to do. Next month Alexis will get the same treatment. My baby is growing up way to fast! 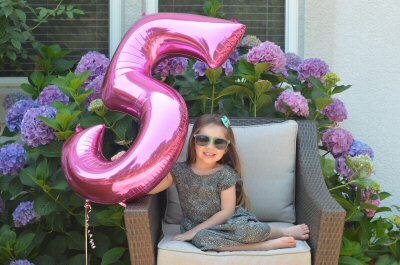 It feels like she was born just a few weeks ago, how in the world is she five already?! 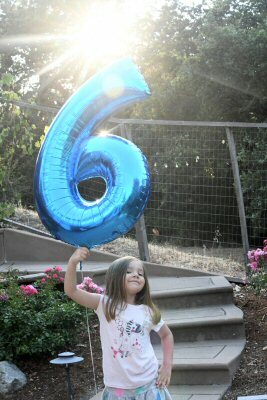 Our birthday balloon photos on the party day are quickly become my favorite birthday tradition. Fortunately this kid is still happy to obliged by crazy momtographer tendencies. Put on a party dress for photos? Sure. Do it again with a different pair of sunglasses? No problem! She even enjoys coming up with her own poses. Yesterday we had a small party for family with a helium balloons and princess cake. As always, the cake was a bit of a swing and a miss. Both kids enjoyed looking at the cake and were excited for a piece, but both kids also only picked at their piece before asking to get down from the table, or requested goldfish and pretzels to eat instead. Both kids will eat angle cake well, but they just don’t get excited for it the way they do the character cakes which makes me reluctant to serve it on their birthdays. Ah well, birthday dilemma. Afterward the family party we went to a restaurant where Nicole got a special birthday dessert. She was so excited for her birthday restaurant and birthday desert that she told both the hostess who sat us and our sever (several times) that it was her birthday. On the way out the hostess remembered us and wished Nicole a happy birthday for the second time. She loves her birthday attention. The kid party will be next weekend. We’re having a low key art party. I bought a whole bunch of art supplies: canvas, sun catchers, beads and the like. I haven’t gotten many RSVPs yet, but Nicole’s closest friends did RSVP in the affirmative. Nicole will be super happy, even if they’re the only ones that are able to make it. Since neither Alexis nor Nicole are really big on frosting, we’re considering getting an ice cream cake for her kid party. All in all I think this birthday is a little more low-key than last one, but no less fun. The addition of a restaurant dinner was a big heat, and she’s really looking forward to the planned activities at her kids’ party. One of Nicole’s School Picture Day Photos. A few years ago when Domingo and I were picking Nicole up from preschool together we stumbled on to a preschool graduation. 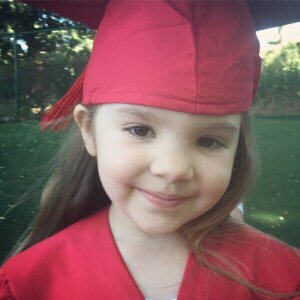 Nicole’s daycare shared a parking lot with three other schools and one of the neighboring schools was having a graduation ceremony for their five-year-olds out on the main lawn. The soon to be kindergartens were wearing caps and gowns, and marching in procession for their parents with their “diplomas”. I told Domingo how silly I thought that was, since the only requirement to graduate preschool is age. Domingo said I’d feel differently when it was my kid. 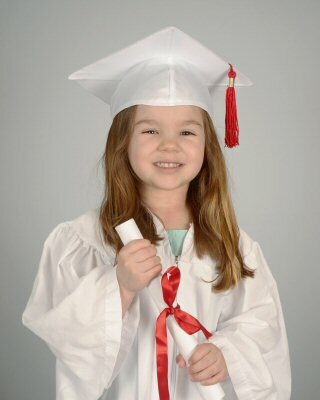 Okay, I admit it – they’re darn cute in the caps and gowns. I registered Nicole for the big K today. In just a few months I will have a kindergartner. Kindergartner. It’s still feels so unreal no matter how many times I say it. Kindergartner. I’m a bit sad that the girls will be in different places next year. Having them at the same school program has been really special, especially in the last few months. Now that Alexis is in the twos room, she gets to spend drop off and pick up time with Nicole’s class. That includes some outside recess time, as well as inside art time. The two of them really seem to enjoy having each other around. They’ll walk to the car hand in hand, ride the tandem bike together, and build together with the magnate tiles. Nicole invites her to play with all her friends, and Alexis adores the attention from the big kids. I love how much Alexis idolizes her big sister, and how Nicole looks after her little sister. Alexis will miss not having Nicole around, but there’s no denying it, Nicole is ready. Her teachers have been saying it for a year now. She may be one of the younger students, but she meets all the kindergarten readiness criteria, and has for a while. She’s ready for the next chapter. Nicole is very excited for the coming year and her new school. So far she’s most looking forward to riding the bus, and building her own rocket ship to take her to Disneyland. Apparently that’s what you do in Kindergarten these days. Someone is having a good birthday party, day? week? fortnight?! When each of the girls was born near a major US holiday (Independence day for Nicki, Thanksgiving for Alexis) I was stoked. Having a birthday near a major holiday meant having an extended weekend for the party. Our family is spread out over both costs, so an extra travel day is most definitely an asset. It turns out having a birthday near a major holiday tends to draw out the festivities. The birthday celebration started off with a school party on the 1st. Grandma and Grandpa were flying in on the 2nd. We like to keep the girls out of school for the week Grandma and Grandpa visit to maximize everyone’s time together. That meant cupcake day at school would have to be the 1st. Who forgot about the school’s no home good policy? This girl! After making two dozen cupcake ice cream cones, fashioning an ice cream cone holder out of an amazon prime shipping box and some how managing to get them all to school relatively in tact I learned the kids would not be able to eat them. There are a couple kids with food allergies in Nicole’s class and even though the cupcakes didn’t have any nuts, the school didn’t want to take chances. I can understand that, it’s their liability after all. Thankfully there was a shop that sold cupcakes near by. When parents arrived at the end of the day they had the option give their child one of the home made cupcakes, so most of the kids got two different cupcakes. That’s not the only thing we had double of do to a Mommy Mistake. Who ordered the wrong sized bike? This girl! I ordered Nicole a 12 inch balance bike. I thought it might be a little small, but doable since she’s on the shorter side. No dice, and now that it was put together I couldn’t return it. Domingo and I made a quick trip to Target where the only bike in her size was a frozen bike with optional sleigh doll carrier. Nicole was most definitely not disappointment about that. On Saturday, when most of her friends had returned from their holiday travels, we had our first ever birthday party with just friends. That’s two sets of cupcakes at school, two bikes (now one for Alexis) and two parties, stretched out over two weeks. Fourpalooza for sure. – Buy Cupcakes/Cakes. Seriously, when will I learn? Our local grocery store charges the same price for the customized cakes as they do for the generic cakes in the bakery refrigerator, and they’re good, really really good. animations, but it’s really improved since I was a kid. We were assigned a party coordinator who was fantastic. Speaking of which, I need to go call them and let them know what a wonderful job our party coordinator did!